Rockford Christian School Choir Director Andy Bruhn rehearses his high school group. A Rockford choir is one of several ensembles picked to perform this week at the Illinois Music Educators Conference in Peoria. The choir and its director were excited about the opportunity to perform. They also looked forward to sharing a program of hope and faith. 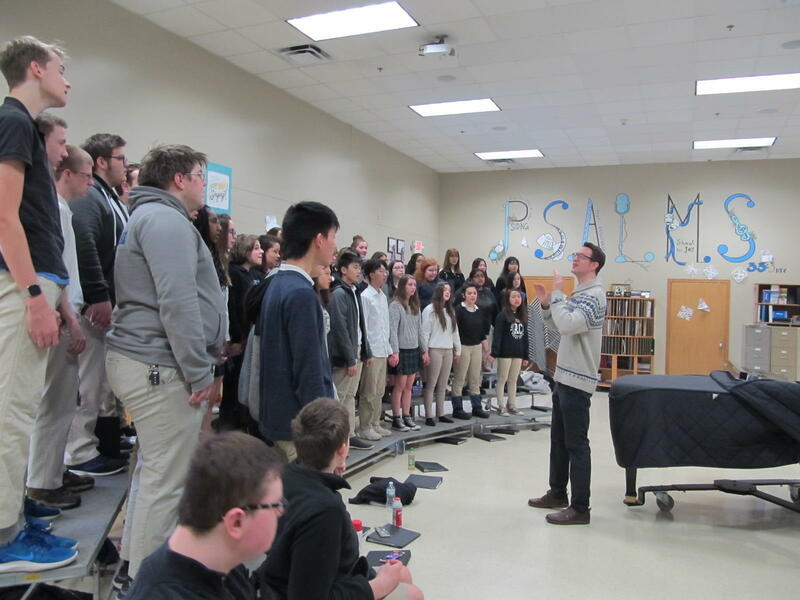 Rockford Christian Schools Choral Director Andy Bruhn said his group is one of just four in Illinois selected to perform for music educators from across the state this year. Bruhn noted that the 53 members are not part of some elite ensemble with strict entrance requirements. "Kids from freshmen through seniors are in the group," he said. "We do have an audition group on top of that, but this is the group that I call the 'Come Y'all Choir' - anyone can join and sing." Bruhn said some couldn't even read music when they started. That means they spend time at the start of each class doing exercises on notation, rhythm, pitch, and other aspects of reading and interpreting music. It doesn't stop there. "We also work a lot on vocal technique every single day," he said. "Just making sure that every student -- whether they're brand new in choir or have been in it for four years or more -- that they really know how to use the instrument in a healthy way." Bruhn said that allows them to concentrate on making music, not just sounding notes on a page. It was last year's choir that won the audition. Many graduated, and are gone, so this is essentially a different group. Bruhn said it was a little scary at the beginning of the school year, knowing where they had to be in a few months time. But, he said, the kids have come together, worked hard, and he thought they would be ready for the conference. Mattie Hammer shared that feeling. With emotion in her voice, she remembered thinking in August they had a long way to go. "That is a journey that we've all been on," she said. "And I'm really proud of the progress that we have made, and how we've come together and become a really strongly connected group of performers." Hammer said choir is now the favorite part of her day, and she and her friends looked forward to their concert in Peoria. The theme for the program is "Songs of Life Unfolding." It comes from a line in a piece the choir will perform by Kim Andre Arnesen called, "Flight Song." Bruhn wanted a theme that would connect with the students, and chose the seven pieces on the program that could be woven into a greater story. "So again, it's not just singing random pieces of music, but they're all telling a story that we're able to connect with," he said. It certainly seemed to connect with sophomore Mattie Berkman. She said it was an amazing experience to be part of the choir, and she loves Bruhn's approach. "Through everything we do we are glorifying Christ," she said. "And every day we talk about him, and it's not just, like, 'Okay, we're going to sing about Jesus now.' We go through and we talk about the music and what we're singing about." The program includes some well-known songs of faith, plus arrangements, but the central piece is a contemporary work by Jake Runestad. Runestad grew up in Rockford and is now a much sought-after composer with commissions from school and professional groups. His work, "Please Stay," is about suicide and suicide prevention. All the words comes from the Twitter hashtag #ikeptliving. Bruhn said it spoke to the program's theme. It also gave the students an opportunity to confront an important topic. "The piece starts off with this cry, 'No, don't go, don't go," he said. "The choir singing in eight parts super loud. And then within about five or six measures [it] goes to super soft and two voices and a solo offering this hope and encouragement." After that, members read texts from the Twitter hashtag. The words were meant for people struggling with suicidal thoughts. But Bruhn said he expanded the discussion to include destigmatizing mental illness. The music, he said, gave the kids "an opportunity to know that the struggles in life are real, and that there's hope and we don't have to wallow in that." Bruhn continued: "But coming together, especially in a community like this and sharing those feelings, those struggles, with each other is going to make you way stronger than going through it alone." And that can happen in a choir: expressing faith through music. It's a message Bruhn and his students hope plays in Peoria – and beyond.